Roy sat in the office, her face buried in her arms. "Ngh...I'm going to die..." She muttered, lifting her head a bit. Her face was flushed and even her voice sounded off. Yeah, she knew she was sick, but would she tell anyone? No. In her mind, people didn't need to worry about her, she could get through this on her own, just like she had when she was in the Akatsuki. "...Meh...Can't even go see Sasuke cause I might get him sick..." She muttered, burying her face against and coughing. "Konnichiwa, Roy-sama~" Zumi sang, knocking on the door before waltzing in. "Gaara-san wanted me to relay these to you..." she placed a manila folder filled with statistics and such on Roy's desk, tilting her head when she heard Roy's hacking cough. I mean, she was a medical nin; she should be able to discern the signs of a bad cold. "Would you like me to get you some tea?" She asked helpfully, clasping her hands. "Or..." her eyes flashed back to the open door, "I'll leave you be..."
Nikki peeked inside of Roy's office, her curiosity getting the better of her, "Ne, are you feeling okay, Roy?" She walked in and past Zumi, instantly putting her hand gently on Roy's forehead, "You're a little warm..." She then realized Zumi was a medical nin and backed up, "Oh, I'm sorry! You're probably more of an expert on colds than I am. I'll let you do your job..."
Roy waved her hand a bit. "I'm fine...just really..." She paused, thinking for a moment, "...Tired is all." She said, looking at the folder. "Damn you Gaara...make me work..." She chuckled, picking up a pen and opening the folder. As she started writing, she moved her right hand (I'm a lefty~ 8D) to cover her eyes. Damn headache...I feel like crap. Zumi's eyes widened, and she smiled at Nikki, "Oh, it's fine, Nikki-san..." She squatted beside Roy, eyes peeking over the desk as she placed her fingers against the varnished wooden edge frame. "I'mma worry about you if you don't let me get you some Ibuprofen, chai tea and soup." Her tone was nearly threatening... she knew her leader well enough to realize Roy didn't want anyone worrying about her. "But!" Her chirpy tone returned, "It's your decision, Roy-sama." Nikki sighed, taking Roy's pen away, "If you're not feeling well..." She shook her head, "The faster you try to get better, the faster you can be better. And you trying not to worry anyone is making me worry even more." She pouted, "Go sleep?" "Nyee! Both of you just back off! I'm fine!" She said, smacking her hands on the desk. "Look. If I get a little cold every now and then it's fine...don't need to announce it. But I'll deal with it. 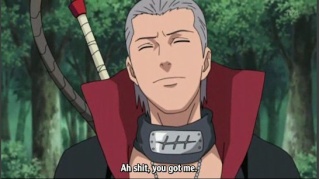 You guys just run along...Zumi go play with Kiba and Nikki go hang out with Neji. Kay? Enjoy yourselves." She said, grabbing another pen and continuing her work. Though, we should all know by now that colds can always get worse...it depends on how they're treated. . .
Nikki bit down on her tongue to stop herself from saying something stupid. She released her tongue, noticing that her mouth was now tasting like blood. "Bit my tongue too hard..." She mumbled, spinning on her heels, "Fine, I'll leave..but if you don't get better, or show any signs of getting better, in a few days...I may just have to get a little more pushy." ". . ." Zumi frowned and dug around in her pack, pulling a small packet of candies from it. She placed it on the desk, "Here are some ginger sweets. The rice paper is edible," she sighed, happiness deflating from her. "I'll go now... See you around, Roy-sama." She bobbed her head respectfully and left the room. Roy sighed, watching as the girls left. Letting out the cough that she had been holding in, she leaned back in her chair. "Ugh...this is horrible! I'm...just going to finish this paper work...no complaining." She said, stretching a bit and starting on her work once more. "...No one needs to worry..." She muttered to herself. She never finished the paperwork...seeing as you can't write when you passed out on top of it. Genius. Zen, who wanted to talk to Roy for some pointless reason, opened the door to the office. Her eyes widened upon seeing her unconscious, her face smushed against the paperwork. "Roy-sama...." She shook her head gently. "You don't always need to be so stoic," she said as she lifted the President and began carrying her to her room. Roy was still crashed on her bed, thanks to Zen. Through that week, how many times had she been out of bed? None. Yeah, unconscious for a week...don't think that's very healthy. Fever hadn't gone away and that nasty cough still persisted even in her sleep. Zen sat worriedly by Roy's bedside. She had called for a doctor a few days ago, but one hadn't come. She was beginning to suspect that he was being purposely delayed. Nikki, who had tried staying calm throughout the week, opened the door to Roy's room once again. She put her hand on Roy's forehead like she had been doing for a week, "Still burning up..." She sighed, putting a cold rag on Roy's forehead and sitting on the ground next to the bed. She mumbled to herself, "What am I going to do? I'm not a medic...but I really want to help more than just trying to keep her fever down." She simply sat next to Roy's bed next to Zen, unwilling to move from that very spot. Cooky instantly slammed through the doorway, eyes wide and frantic as she glanced rapidly around the room. "Where is she?!" She demanded, stalking through the door with murder glinting in her eyes. "Who did it to her?! I'll kill them. You hear me?! I WILL END THEM!!" Nikki jumped, "C-cooky-sama!" She shook her head, looking back at Roy, "We don't know what happened...she just...passed out and now she's in a coma of some sort..." She hung her head, "And none of us know what to do now..."
Cooky, in her blind anger, let out an agrivated growl and instantly pushed the other girls aside (gently, mind you; even being so furious she could hardly see straight she would never harm them), pressing her fingers at the pulse in Roy's wrist and her ear at her heart. She sat still for a long while, eyes hard and serious. After a brief period which involved the VP gently pulling open Roy's closed eyelids and mouth, Cooky stood up fluidly from the bed, the corner of her lips twitching in repressed rage. "...I think she's been poisoned. We'll have to get Minoushje to confirm it, though."